This is Tennessee Titans wide receiver Drew Bennett, from yesterday's Tennessean, reminding us once again how happy we are that they let white people play football. 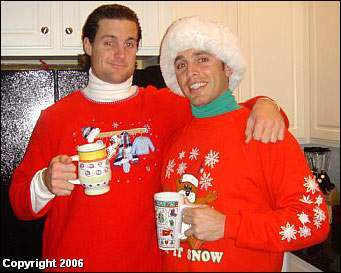 Actually, The Tennessean has uncovered, this morning, how all the "hip" Nashville twentysomethings have been hosting "Tacky Christmas Sweater" parties, where they all wear sweaters like Bennett's. Though we're not sure this can be called a Nashville "trend" as much as it can be called a Nashville "Tuesday."